The humble perception of cookies means diners and chefs often don’t think of them as special enough for restaurant dessert menus. But more chefs are giving cookies their due by serving up tasty takes, often with glass of cold milk or supersized for sharing. “Cookies don’t get the attention they deserve because people think cookies are too simple and ordinary,” said Miro Uskokovic executive pastry chef at Gramercy Tavern in New York City. Uskokovic celebrates cookies at the seasonal fine-dining restaurant with his Cookie Plate. The plate features rotating combinations of seven unique cookie creations, plus Uskokovic’s takes on classics, served with a cold glass of local milk, or eggnog during the holiday season. Over the years, more than 60 different cookies have been featured, ranging from oatmeal and snickerdoodle to poppy seed strudel and lard shortbread with raspberry jam. 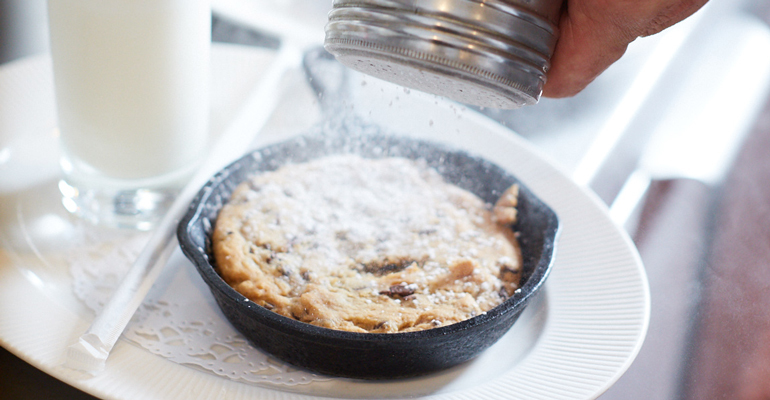 House-made chocolate chip cookie in a mini iron skillet with a vanilla milkshake at Sandbar in Cold Spring Harbor, New York. The Cookie Plate is one of the restaurant’s most popular desserts, and about 70 to 80 are sold each day, Uskokovic said. At Oriole, a fine-dining restaurant in Chicago, pastry chef and partner Genie Kwon offers a Milk and Cookies truffle as a part of the mignardises (miniature pastries and sweets generally served after dessert) at the end of a tasting menu experience. Kwon’s dessert, which looks like a black and white cookie and is filled with cookie dough and a liquid milk center, is intended to provide a nostalgic milk and cookies experience in one bite. Sandbar, an American seafood and pub-grub spot with a nautical theme in Cold Spring Harbor, N.Y., offers a take on the classic pairing featuring a fresh-out-of-the-oven chocolate chip cookie in a mini iron skillet with a vanilla milkshake. 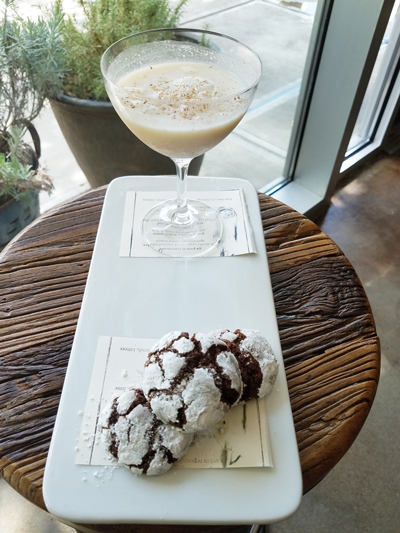 Chocolate Crackle Cookies are served with spiced (and, if diners prefer, spiked) milk at Saltyard in Atlanta. “It’s not often that you find a good milk and cookies dessert at a restaurant,” said Sandbar general manager James Olsen. “The challenge is to bake them well and to do so consistently. Our team has figured out the trick." The signature dessert at Westbound, a craft cocktail bar in Los Angeles, is Milk N’ Cookies. Popular — especially late at night — the warm brown butter and chocolate chip cookies are served with a glass of whole milk and can be spiked with Bacardi 8 Rum upon request. Similarly, at Saltyard in Atlanta, executive chef Nick Leahy serves Chocolate Crackle Cookies with spiced milk (nutmeg, vanilla bean and honey) and the option to add bourbon. Some restaurants are offering oversized cookies for diners to share, but are leaving off the milk. On the menu at Avvio in Cranston, R.I., is a giant Almond Cornmeal Cookie that the server smashes tableside with the back of a spoon, breaking it into pieces ideal for dipping into the accompanying butterscotch and whipped cream. And a recent addition to the menus at Summer House Santa Monica in Chicago is a giant Pumpkin Cheesecake Cookie.